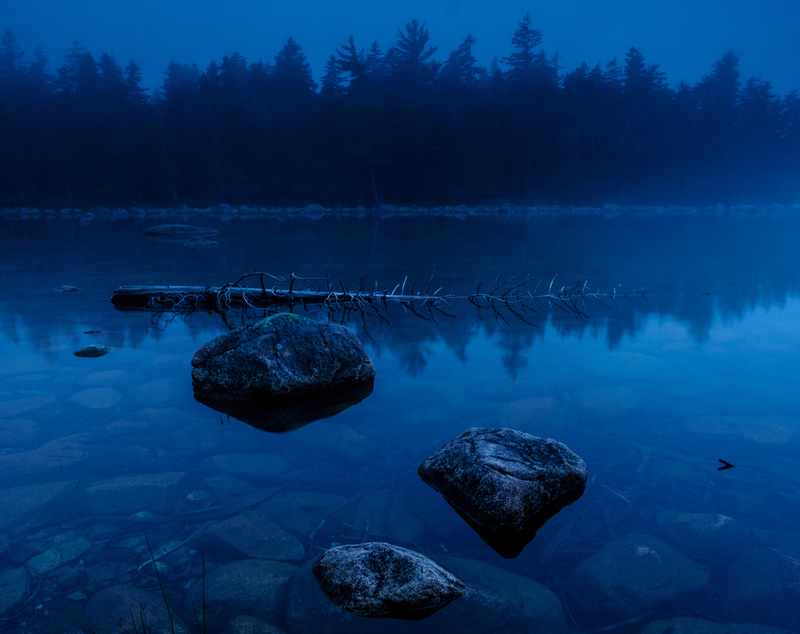 The water, sky and mountains of coastal Maine make Acadia a singular experience. Photograph rugged Maine coastline, oceanside cliffs, forest lakes and ponds, groves of birch and aspen, carriage roads that weave into the wilderness—all under the Milky Way and the glitter of the Eta Aquarids Meteor Shower. NOTE: Deposit of $300 required to reserve your spot at the workshop. Balance of $1,200 due on 4/2/2016. Or, you may choose the "Pay in full" ticket if you desire to pay all at once. THIS EVENT HAS PASSED. Thanks for your interest! As with all National Parks at Night photo workshops, we will teach at this location only once. If you have a dream of making epic long exposures at night in this park, we hope you will join us. This late-spring workshop in Acadia National Park will entail five nights of photographing some of the most beautiful scenery on the New England coast. The experience will begin under a waning crescent moon, and will culminate under the dark skies of a new moon and the peak of the Eta Aquarids meteor shower. Celestial conditions will be perfect for photographing the Milky Way over iconic Acadia scenes such as Eagle Lake and Monument Cove. Each night will consist of working in some of Acadia’s best-known and little-known spots, photographing stars and star trails, and light-painting coastal rock formations, forest waterfalls and stone bridges on the park’s famed carriage roads. 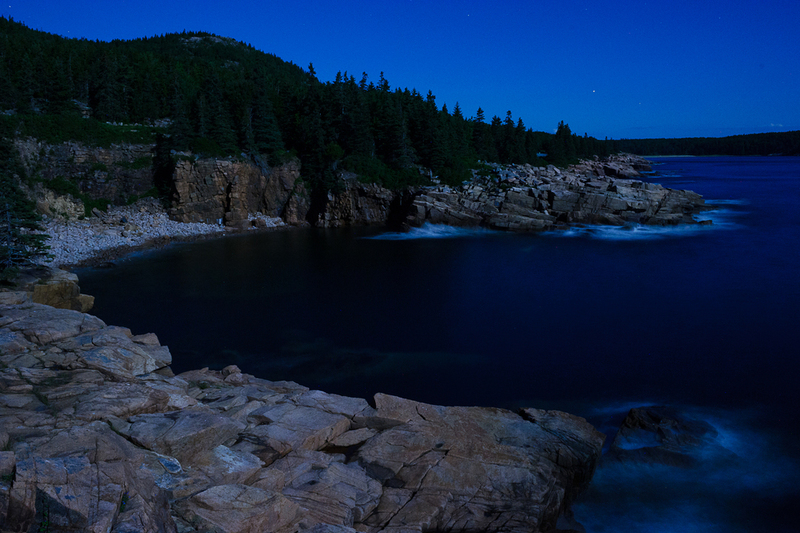 During the day, after a good morning’s sleep, we’ll gather to review images and to engage in classroom discussion and instruction, focusing on night-photography techniques, post-processing tips, photo secrets of Acadia and more. Acadia National Park will be celebrating its 100th anniversary in 2016. It was the first national park created in the eastern United States, and today is one of the most visited sites of the park system. Moreover, it’s one of the country’s foremost destinations for photographers. In addition to the aforementioned locations, potential photography sites for this workshop include Boulder Beach, Sand Beach, Cobblestone Bridge, Hadley Brook Falls, Sieur du Monts, Great Head, Cadillac Mountain, Bass Harbor Head Lighthouse, Jordan Pond, Pretty Marsh, Schoodic Point and Little Moose Island. Spring temperatures in Acadia can range from freezing to perfectly comfortable—it’s not uncommon to begin and end a day in jeans and a coat while wearing shorts and a T-shirt in the afternoon. Morning fog and drizzle are common, so carrying a raincoat (and even rain pants) is prudent. Because of the frequency of working around water, it is also advisable to wear waterproof trail shoes with good support and aggressive tread. The majority of Acadia National Park is on Mount Desert Island, itself a fine photography destination with its old New England architecture, public gardens, secluded bays and coves, and working lobster-boat harbors and fishing villages. The island also offers a selection of services and amenities, including excellent food options at all price points. Though you may lodge where you wish, we will have a block of rooms reserved at the scenic and historic Bar Harbor Inn & Spa, which will serve as the site for our daytime instruction. The hotel sits at the shores of the bay and right at the edge of town. Though Bar Harbor is by far the biggest settlement on the island, we’ll be there “pre-season,” so we won’t be subjected to its customary crowds. For participants who would like to remain closer to nature, myriad camping options are available on the island, including two excellent campgrounds within Acadia’s boundaries. The first time I visited Acadia National Park was in 1997. I was on a weeklong project with another photographer creating autumn scenic images of the Maine coast. Our specific destinations were open to our whims, so we meandered onto pretty much any peninsula and island that serendipity brought us to. But one destination that was planned ahead was Acadia. We weren’t sure what we’d find (this was before the days of Flickr research and photographers’ travel guides), but we were drawn there nonetheless. Upon driving into the park, we immediately knew it would be the photographic and experiential highlight of our trip. We explored the shore, driving the ocean road along clifftops and past cobblestone beaches. We drove to the top of Cadillac Mountain and walked its granite summit among spruce and pitch pine. From the heights of the mountainside we surveyed the fall color surrounding Bar Harbor and lacing the Acadia forests below, and we peered over the water at the islands of the surrounding bays and seas. We photographed the waterfront boulders of Jordan Pond, fallen leaves swirling in the gentle currents of Duck Brook, and the rustic spans of the stone bridges on the carriage roads. It was a busy day. Seriously, yes, we did all that in one day. Acadia is that kind of park. Beauty is everywhere, in various forms, and much of it is relatively easy to reach. The next morning we concluded our Acadia portion of the shoot by hiring a pilot to fly us over the park and the surrounding islets and islands. In the years since I've visited and photographed Acadia about ten times, and it's become one of my favorite places in the world. But I'll always remember that first experience, that first day, when I found a love for the East Coast's first national park.